Puri(PTI): Renowned sand artist Sudarsan Pattnaik today created 108 sand Shiva Lingas at Puri beach on the occasion of ‘Maha Shivaratri’. While each Shiva Linga is about 2 feet high, there is also a 5 feet high idol of Lord Shiva. 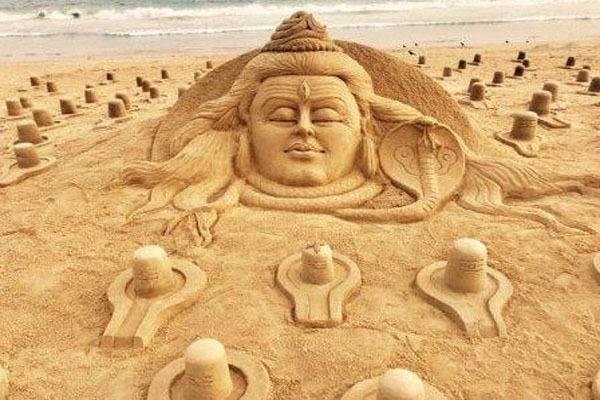 “We pray to Lord Shiva for World peace”, said Sudarsan who participated in over 50 international sand art championships and won many prizes. Students of his sand art institute also joined hands with him to complete this sculpture. Pilgrims and tourists from different parts of the country witnessed the sand Shiv Lingas. there is also a 5 feet high idol of Lord Shiva.